Worry not readers, I have no spoilers. Truth be told--if you hadn't already noticed--I'm kinda over the Downton. Don't get me wrong: I was obsessed with the first season when I found my way to it on Netflix about two years ago. And I dutifully watched every episode from the second and third seasons, with rekindled (though ultimately misplaced) optimism and hope that the magic would return. I'm sure that like many, were it not for Dame Maggie Smith being at her absolute Dame-Maggie-Smith-iest, I would have checked out a long time ago. Seriously, I could watch this over and over again. For those unfamiliar with the show, Downton Abbey is a costume drama set in rural England on an estate owned and managed by the Crawley family in the early twentieth century. The times they are a-changing as the Great War looms in the distance (and arrives/passes in the second season) and everything that once made the United Kingdom an imperial powerhouse starts to slowly crumble. But through it all, Downton perseveres! (A refrain that passes from endearing to nauseating fairly quickly--I think it might actually be the exact line Shirley MacClaine had to spout at the top of the third season) Downton Abbey houses two different worlds ruled by the class dynamics that are among the old traditions under siege by the changing tides: the Crawley family represented the landed gentry and a variety of maids, butlers, cooks and other servants working "downstairs" make up the lower class bustling in the background. The tragedy of the series--that is to say its depreciation in quality and not the mechanics of its genre--has come in its desire to abandon what made the first season so rich: character development via the quotidian. In place of examining the complex and dynamic reactions to the mundane events of everyday life--to say nothing of how they are absorbed and experienced differently across class lines--Downton Abbey has gone the way of the serial soap opera. The episode which features Maggie Smith twirling in that swivel chair above: want to take a guess what the major plot conflict is in that episode? ... Wait for it ... It's a rose garden competition. ... How do the various members of the Downton estate interact with the annual rose garden competition?! Contrast that to the love triangles and half-hearted paralysis/impotence storylines congesting the second season and the neverending prison plot or convoluted ethics of inheriting a late fiance's dead father's fortune plaguing the third season. Granted, the drama is bound to ramp up when you go from the time prior to World War I to what it was like for Great Britain during World War I. I get that it maybe can't be about the annual rose garden anymore competition anymore. .... But it actually would have been better if it had. The war goes on. The bodies return--alive, dead, or maimed. The economy crashes. But you know what, in all that crisis, the quotidian remains. The mundane, not Downton, perseveres! Because even in the craziest of moments, the insignificant still carries on. The elements and aspects of life which often go unnoticed, they tend to still go on unnoticed, whether in times of calm or chaos. And I think it's in this element that one character of Downton Abbey--one who is not played by Maggie Smith--has stood out to me. Oh, hi there! I'm Edith Crawley. Charmed to meet you, I'm sure. Bet you weren't expecting me. ... That's quite all right. ... No one ever does. Edith. Poor Edith. Edith is the second of three sisters. She is consistently referred to as the ugly one on the show as compared to her elder protagonist sister Mary or her sprightly ingenue-of-a-younger-sister Sybil. In the first season, Edith is the closest thing Mary has to an antagonist. And afterwards, she slips into storylines which would consistently leave characters and audiences members alike reflecting on a simple thought: Poor Edith. In the finale of the third season, when a waiter--a Mr. Mosley of the downstairs cast--accidentally gets drunk at a holiday party, after making such a fool of himself at the estate cricket game just the episode the week before. Mosley just can't seem to get anything right. In his holiday drunken stupor, he did or said something that made me turn to my roommate and say patronizingly: "Oh, Mosley. He's the Edith of the downstairs." 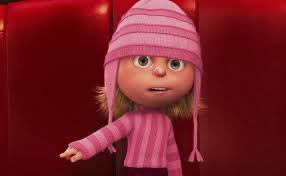 Now, it might surprise you that what inspired me to reflect on Edith is not actually the upcoming airing of the fourth season on PBS, but actually an almost consistent viewing of the animated summer blockbuster Despicable Me 2. I am currently visiting my parents, niece, and nephew in Florida for the holidays. Among the myriad of Christmas presents my niece and nephew received, the DVD of Despicable Me 2 must be the most treasured. For while I never saw the film in theaters nor managed to catch the first in the series, I have since watched the sequel once a day for the past four days. And Thursday we might have watched it twice. Steve Carell voices a former villain turned adoptive father who is recruited by Kristin Wiig to find and capture another evil villain. I'm informed that the main plot point of the original movie is the turn Carell's character makes from villain to father. He adopts three girls (orphaned sisters) and his love for them puts his designs to steal the moon in conflict with the need/desire to attend the girls' ballet recital. A simple thing, the love of children, turns the heart of a man that could control the heavens. The eldest is named Margo and the youngest, Agnes. Any guesses what the middle child is named? She's the one on the end that's middle sized. Oddly enough, middle children named Edith are apparently never allowed to be brunettes like their sisters. So after viewing Despicable Me 2 for the fourth or fifth time today. I realized something: Edith the cartoon has next to no character. 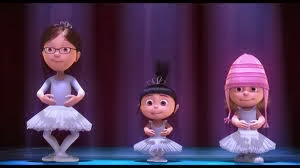 Unlike Margo and Agnes, she has no plot line. There's no cute boy that catches her eye or a desire to find a mother. Basically all she's got is a lame catch phrase ... or rather just one line that she says about three or four times. I don't know if Edith is any different in the first film, but in the second movie, she's completely superfluous. You see that right there? That invisible thing that's totally there that I'm pointing to. It's the legitimate reason the writers provided for why I should be in the sequel. But here's the thing, while lack of purpose makes Edith the cartoon perfunctory, it is the redeeming quality of the Downton Abbey character. Unlike Mary, Edith has not been invested in the future of the Downton estate or love triangles. Unlike Sybil, Edith, at her best, has not been involved in suffragist politics or dating/marrying Irish revolutionaries. 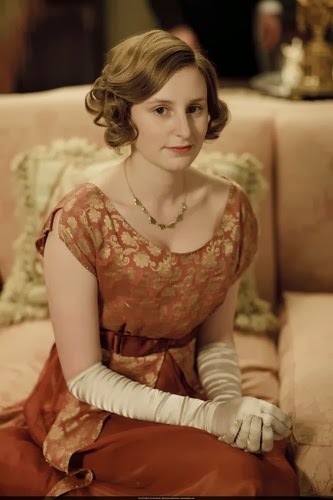 I'll concede that in the third season, Edith suffers a huge dramatic plot twist when she's left at the alter; however, I also argue that that is also when the development of Edith's character also suffered. Sure it evoked a "Poor Edith" response, but really, Edith is not the girl that gets jilted--she's the one who's big issue is whether or not she marries a man a little older and with a bit of a limp. Viewers might say she's boring, her love interest was boring, or her stories are boring. But it's not that they're boring; it's that they're ordinary, mundane, quaint. Edith is the stuff of rose garden competitions. My guess is that will not last. 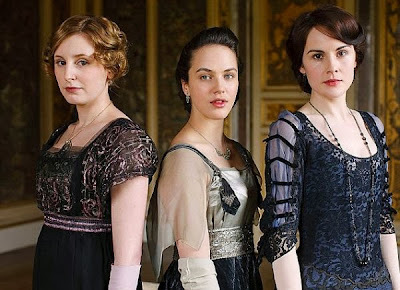 One spoiler I've heard makes it sound like Edith is going the way of the other Crawley sisters and downstairs workers. She will no longer be a repository for the last few vestiges of simple stories. And that is a shame. She will have a captivating story to watch ... and so there probably won't be any character development worth seeing. Poor Edith. Sometimes, I feel like Edith. As you observed in your comment on my pants post, us quiet women get overlooked. I'm probably cooler than Edith (I say that based solely on my knowledge that Downton airs on PBS), but Edith and I are what make up the majority of people. We just go about our business and try not to make too much fuss. I wouldn't say poor me because I like my boring life, but, in the middle of such a dramatic soap-type show, it's easy to say poor Edith. Maybe she's better off?